Anchor supports Web Distributed Authoring and Versioning (WebDAV), which is an extension of the HTTP protocol. WebDAV is another way for end users to view and edit documents – both personal and through team shares – located in the cloud. Before end users can use WebDAV, private cloud model environments must be configured to support WebDAV connections. WebDAV can be enabled for all users of a given organization, or on a user-by-user basis. For information on WebDAV limitations and known issues, please reference the What are WebDAV's Limitations and Known Issues Knowledgebase article. For private cloud environments, existing Certificate Authority signed SSL certificates must be modified to allow for WebDAV functionality. For more information, please reference the How Do I Configure the Anchor Server for WebDAV Support Knowledgebase article. For more information on how end users can avoid multiple WebDAV Login prompts, please reference the How Do I Avoid WebDAV Login Prompts Knowledgebase article. Within the appropriate organization, click the Accounts tab. The Accounts page displays. In the Accounts page, find the appropriate user account, and click the Edit button. The Account Settings page displays. 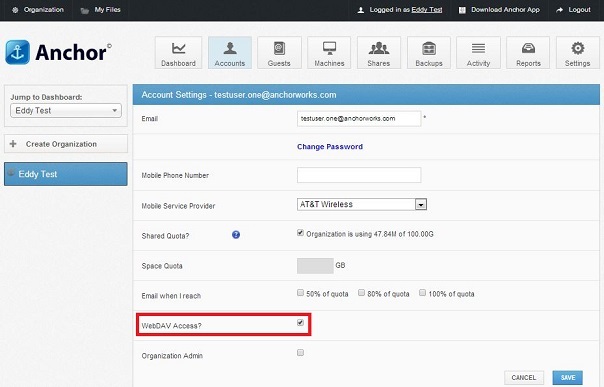 In the Account Settings page, click the WebDAV Access checkbox. Click the Save button when you are finished. 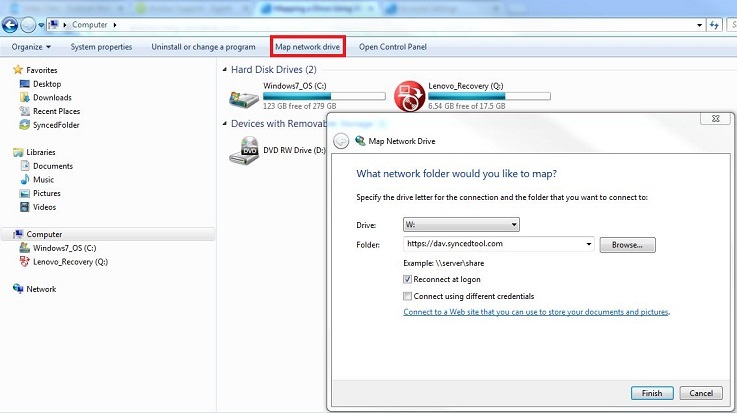 From a Windows Explorer window, right-click This PC and select Map Network Drive. The Map Network Drive dialog box displays. In the Drive drop-down menu, select your preferred drive letter. Enter your username and password when prompted and click the OK button. Note: If you are logging in with an imported Active Directory credential, use the following format: domain \username. Your personal folders and team shares will now display. You will be able to access the WebDAV folder in My Network Places. To optimize the WebDAV connection, please reference this Microsoft Support article. From your Start menu, click Computer. The Computer dialog box displays. In the Computer dialog box, click the Map Network Drive button. The Map Network Drive dialog box displays. When you are finished, click the Finish button. Note: If logging in with an imported Active Directory credential, use the following format: domain \username. In Finder, click the Go menu and select Connect to Server. The Connect to Server window displays. When prompted, enter your username and password. Active Directory users must enter credentials as domain\username. When you are finished, click the Connect button.